Sally Hansen lover that I am, I have fairly few from the Maximum Growth line. Vital Violet is a mauve-y frost. It went on smoothly and the brushstrokes settled nicely, but it stayed dentable for way longer than I'd like, even with my usual fast dry top coat. I do like the color, though, not quite neutral but not too flashy for work meetings. I have no recollection of when or where I got this, which I think may be a bad sign. Of what, I'm not sure. Too many bouts of hauling frenzy? My brain running out of room to store information? 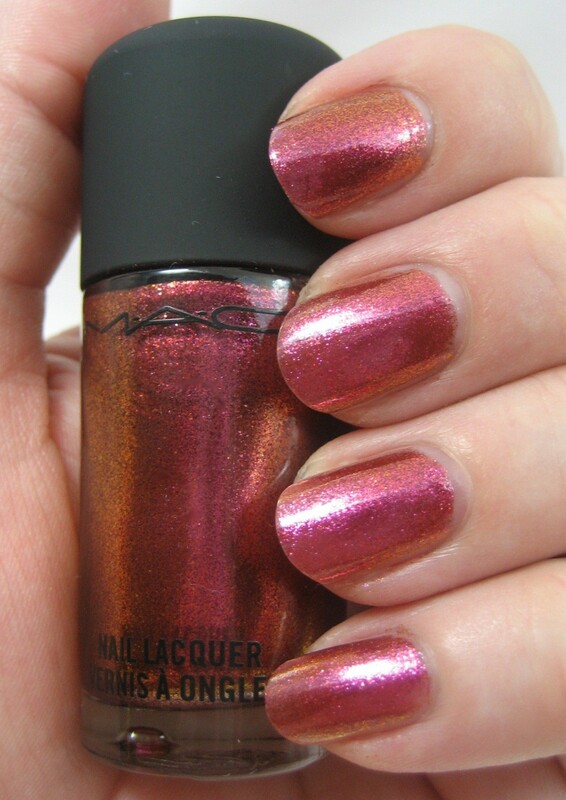 Today I have swatches of MAC Bad Fairy from the Venemous Villians collection. I was not going to buy this one because MAC limited edition hysteria makes my head hurt, and I just didn't want to have to call around and find a counter that would put one aside for me and drive who knows where to get it. I did want it because I do like Disney, and while I had the dupes for the other two nail colors in the collection, no one had found a match for this one early on. I happened to be online the Sunday after the release when a kind person I know from the MUA nail board made a few available for sale on LiveJournal at what I thought was a very reasonable price, so I decided that was a sign and sent off a private message and crossed my fingers hoping I'd been fast enough. I was, and not too long after I had this beauty in my hands. 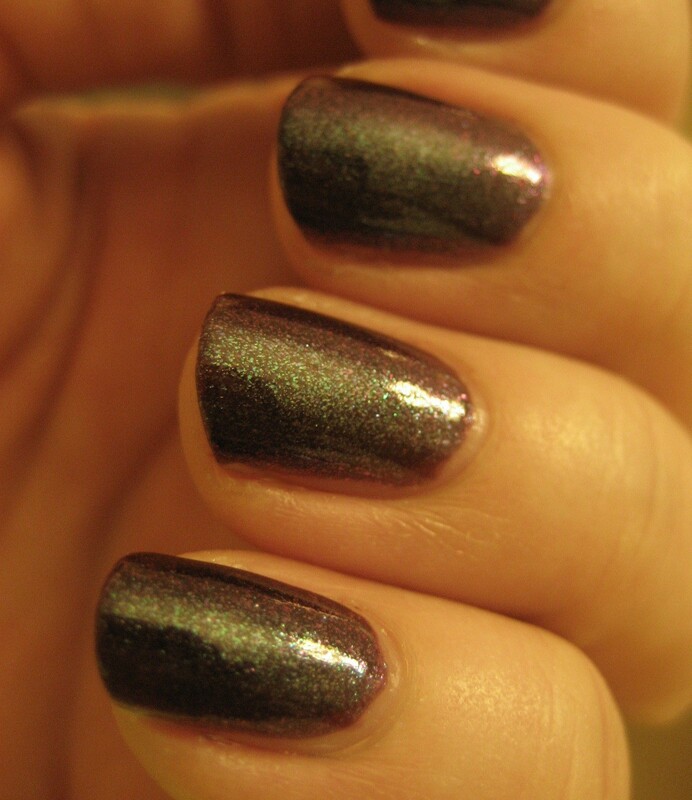 It's a duochrome, so that means lots of pictures are necessary. The first four photos below are in varying levels of indirect indoor light, and the last one is outdoors in the sun, where Bad Fairy really glows. 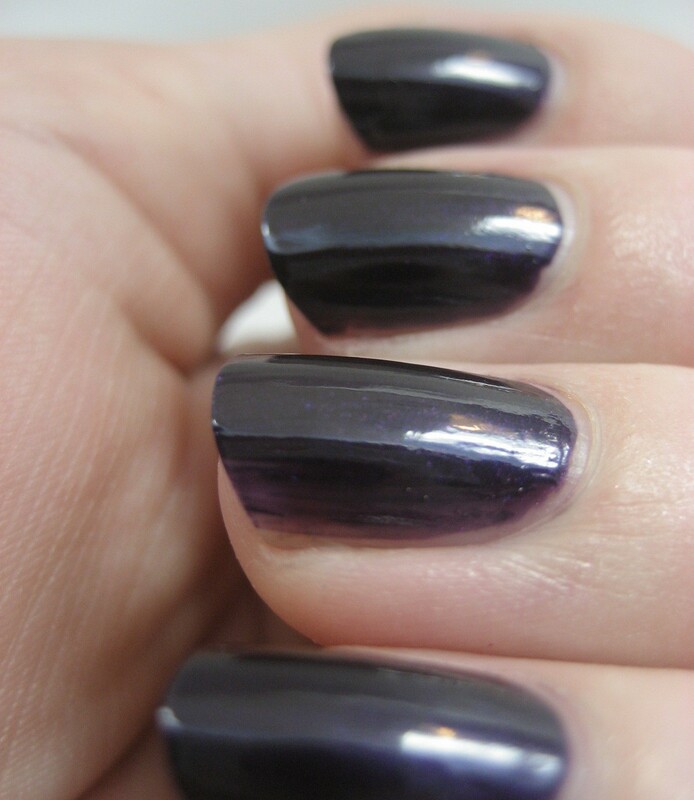 It's a bit sheer; I used three coats and still got some nail line showing in some lights. 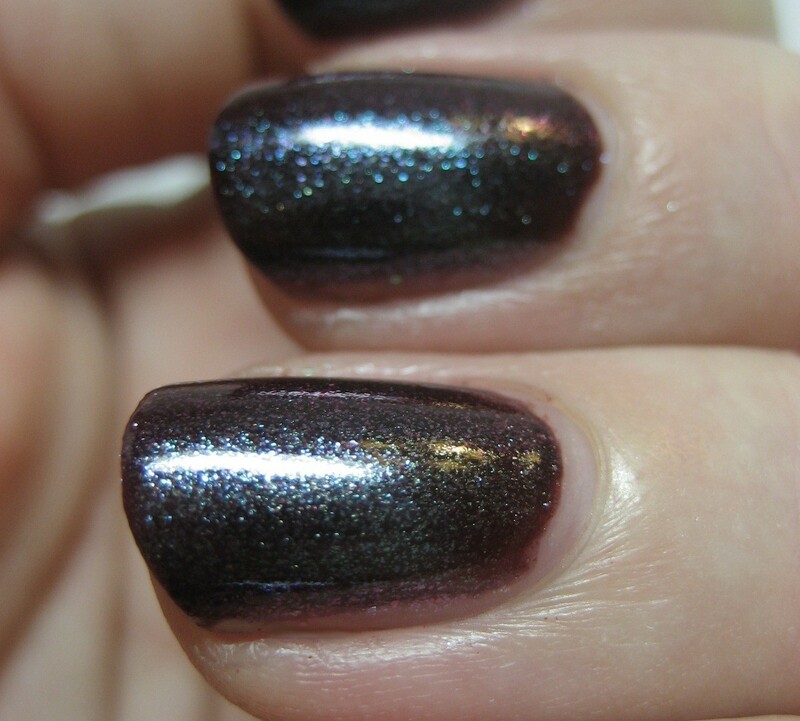 The duochrome in Bad Fairy reminded me of a Sally Hansen Nail Prism I'd gotten in recent swap, Bronze Ruby. 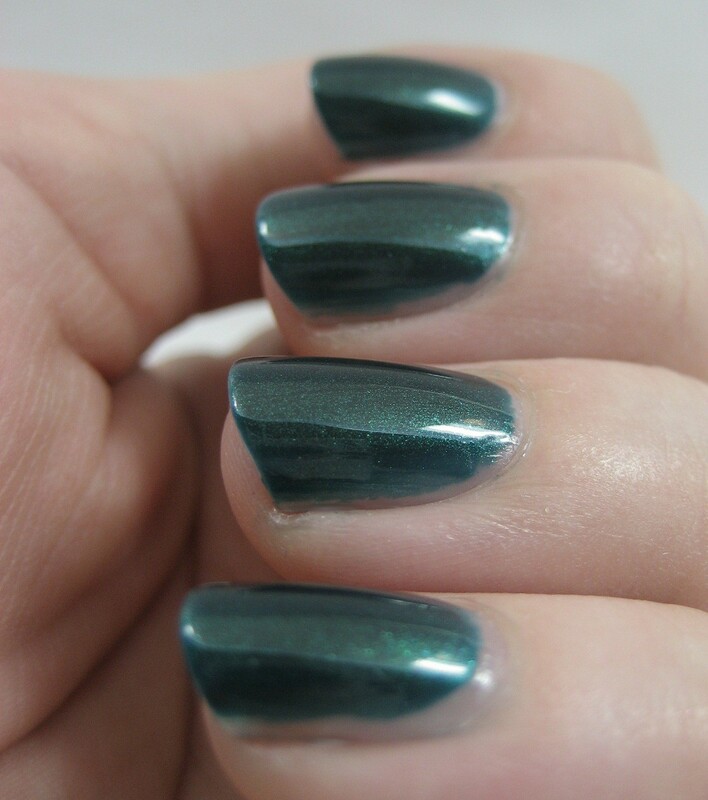 I knew the Sally Hansen wasn't a dupe because it lacks the foil-y grittiness of the MAC, but I thought maybe layering might help with that. 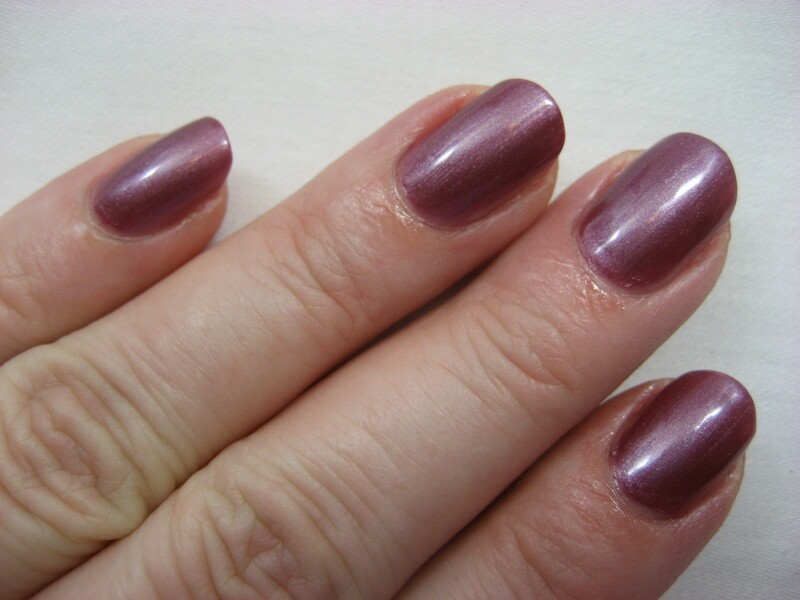 I first tried one coat of Sally Hansen Xtreme Wear Fireberry Red under two coats of Bronze Ruby on my middle finger. That combination was no Bad Fairy, though in the sun it did look sort of similar. Top to bottom: Bad Fairy, Fireberry Red with Bronze Ruby, Bad Fairy, Bad Fairy. 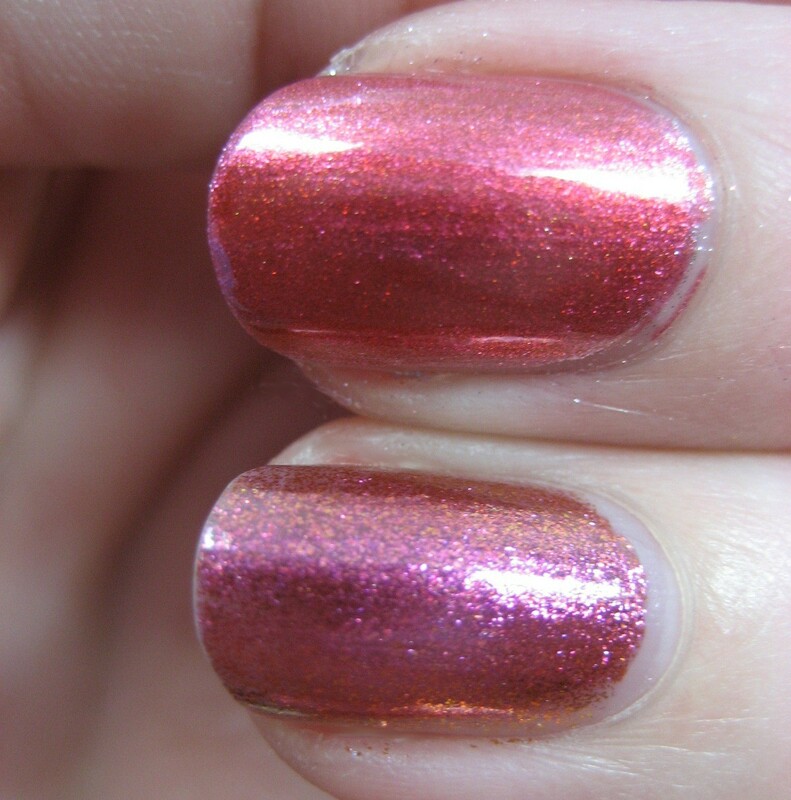 Fireberry Red with Bronze Ruby (top), Bad Fairy (bottom). Next I tried two coats of Orly Shine (a silver foil) under two coats of Bronze Ruby to try and get that metallic-y thing going. 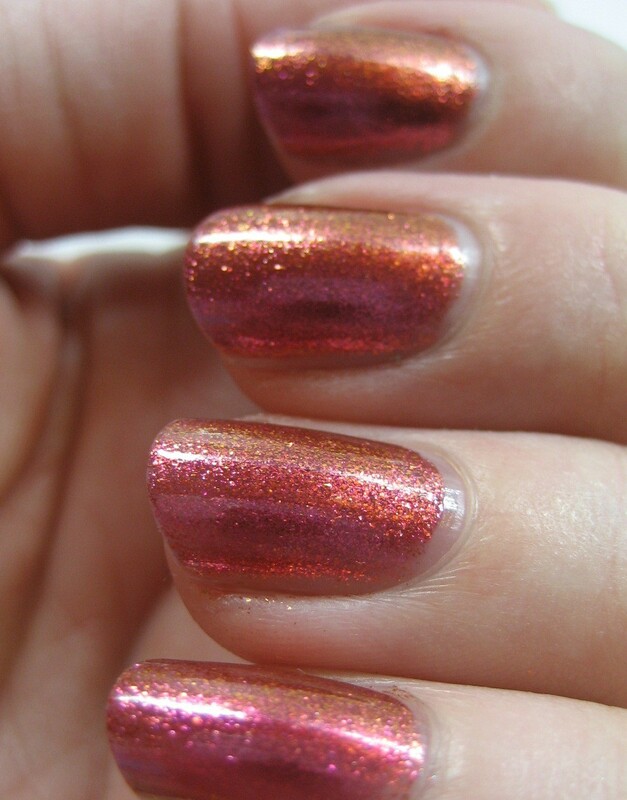 The texture of that combination was closer to Bad Fairy than my first try, but the color was still off. I did like the effect of the Prism over the foil, so I plan to do some more experiments along those lines to see what I can come up with. 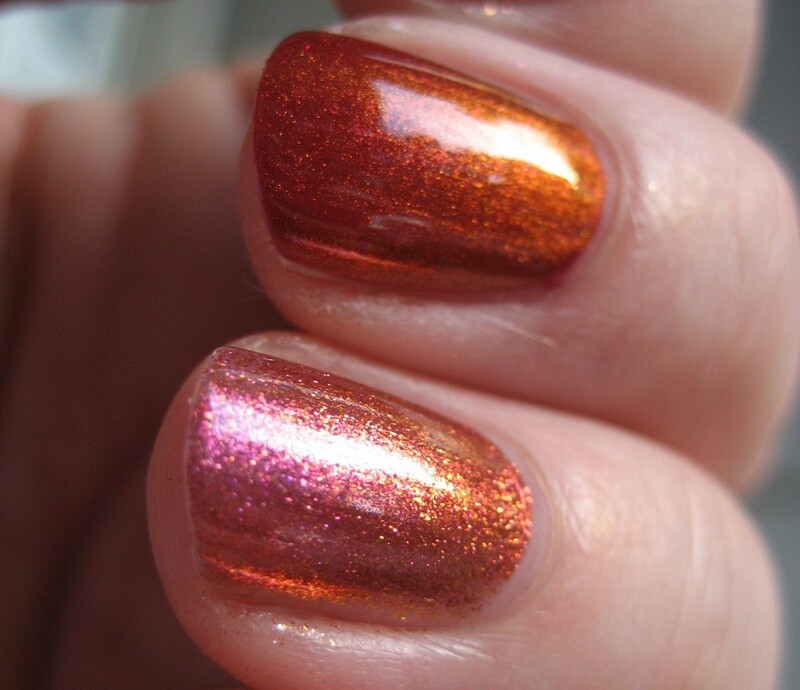 Orly Shine with Bronze Ruby (top), Bad Fairy (bottom). 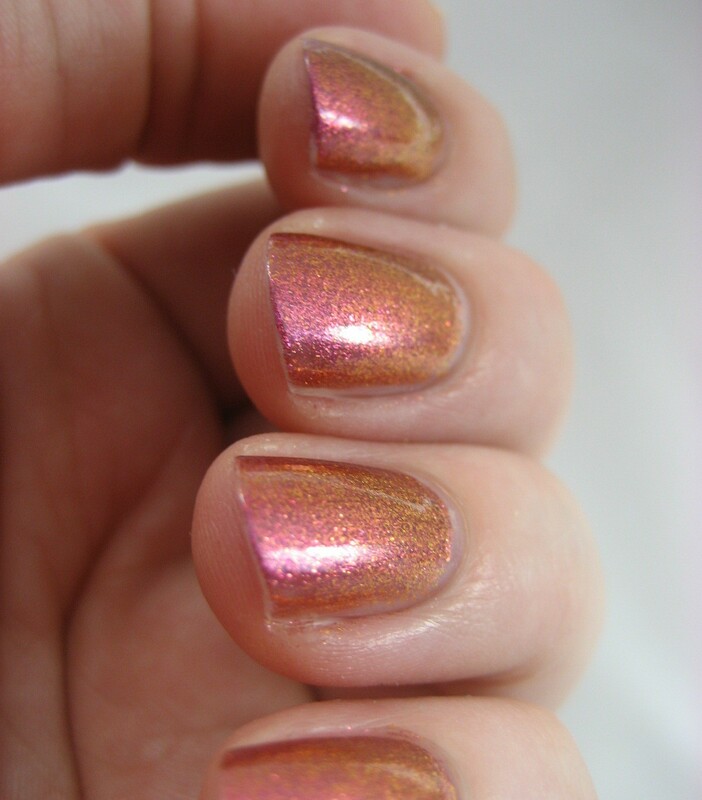 I've seen mentions of other polishes being dupe-y to Bad Fairy. 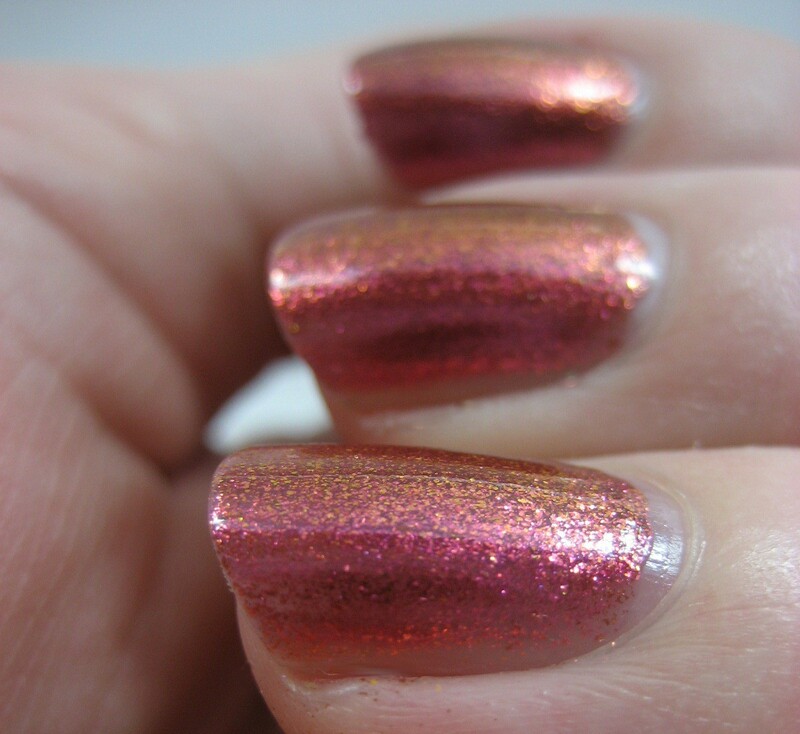 OPI DS Perfection is one leading candidate (not that it's easy to find anymore), though All Things Nails found it to be not that close. Same story with OPI The Show Must Go On according to The Lacquerista. Milani Hot Flash from this past summer has a similar texture and base color but lacks the duochrome. Accessorize Pink Spice seems to be the current front runner in the dupe race, but some say it's not a perfect match either. Right now, I'm feeling glad I was able to get Bad Fairy. Nail Wheel Wednesday is back after its impromptu hiatus. 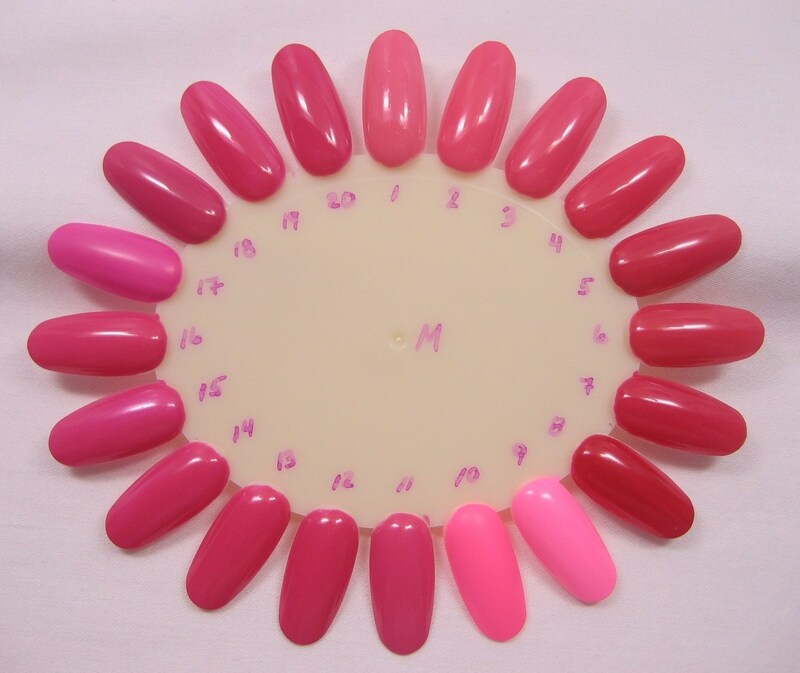 Today it's pink cremes. Let me know in the comments if you have any wheel requests for future installments. I'm back from vacation but still wearing the polish I put on before I left, so this will be an actual Nails of the Day post for a change. This trip was in celebration of mine and Mr. Karen's 24th wedding anniversary, and we decided to go to the theme parks in Orlando. On our honeymoon lo so many years ago, we'd spent time in Disneyland and Knott's Berry Farm, so going to Walt Disney World and the Universal parks seemed fitting. I didn't want to spend time fussing with my nails on the trip since the point was to be together as a couple, and Mr. Karen is not particularly interested in nail polish. 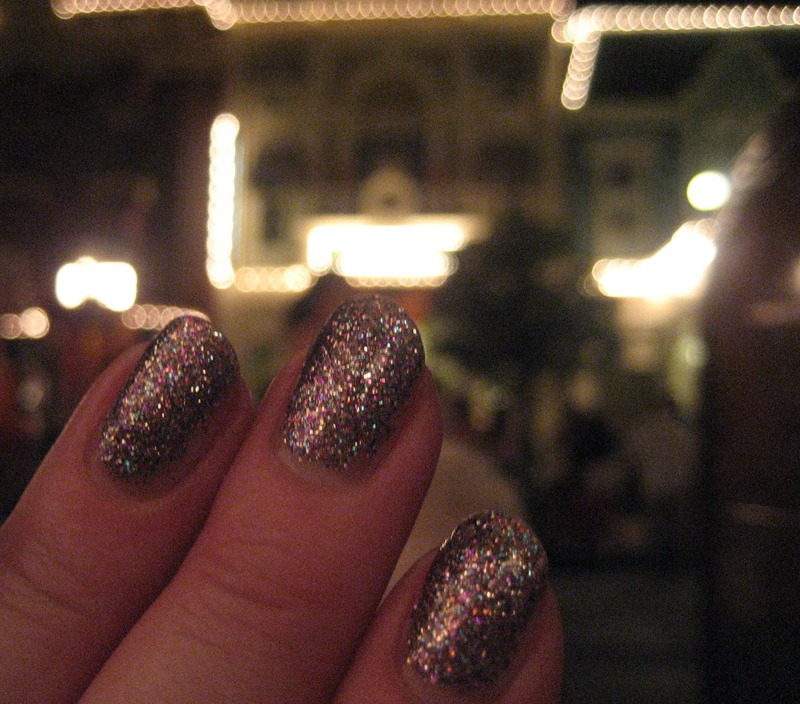 I considered trying Shellac, but never got around to making an appointment, so very late the night before we left, I put on OPI Mad as a Hatter, since I figured a dense multi-colored glitter like that would be easy to touch up, plus it pleased me that we were going to Disney and Mad as a Hatter is from a collection inspired by a Disney film. 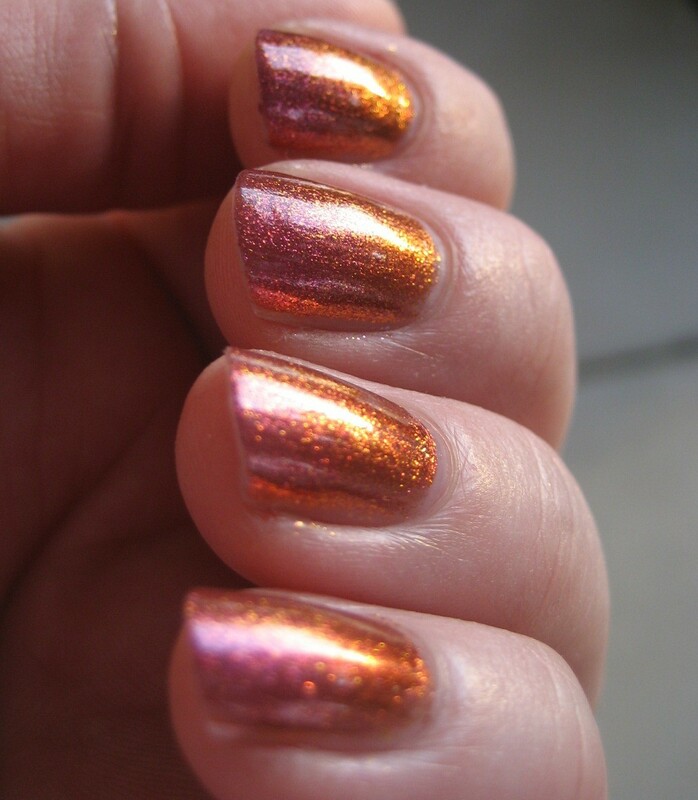 I didn't take any formal lightbox photos of this polish; instead, I snapped candid shots as I went along. 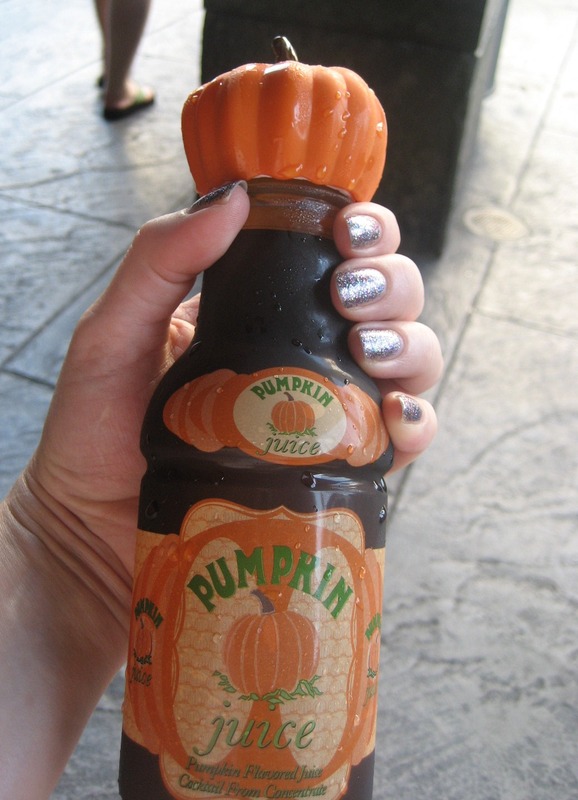 Holding a bottle of pumpkin juice in the Wizarding World of Harry Potter at Islands of Adventure on the 21st. In the lobby of Disney's Polynesian Resort before dinner on the 23rd. It's our favorite Orlando hotel, but we stayed elsewhere this trip, because while we do love it, it's hella expensive. 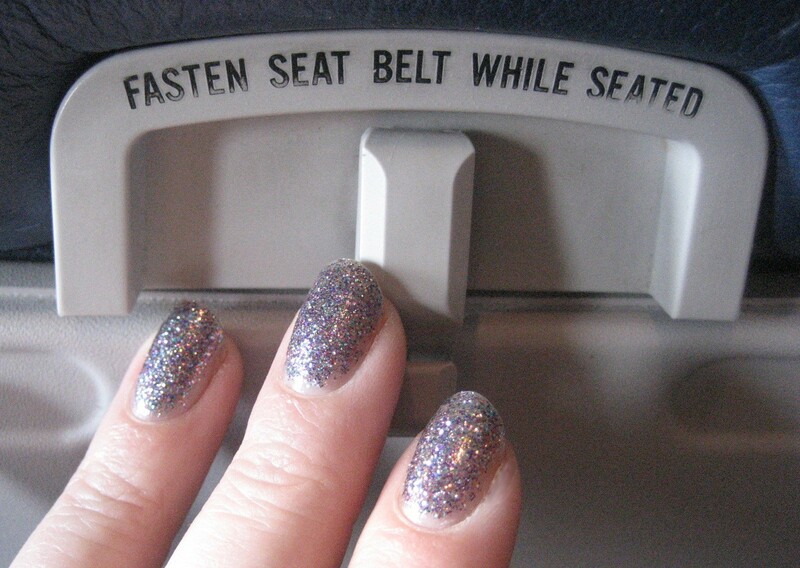 I really need a "glitter fill" by now but was having too much fun doing other things to do a touchup, and since I hadn't gotten any chips, I didn't need to dig the polish out of the protective wrapping I'd put it in for travel. I did finally get a chip yesterday, but it's along the side and barely noticeable so I haven't bothered to fix it yet. If we'd gotten home earlier last night I might have taken it off and put a new color on, but now I'm thinking I might keep itand try a crackle polish over it, inspired by jaljen. 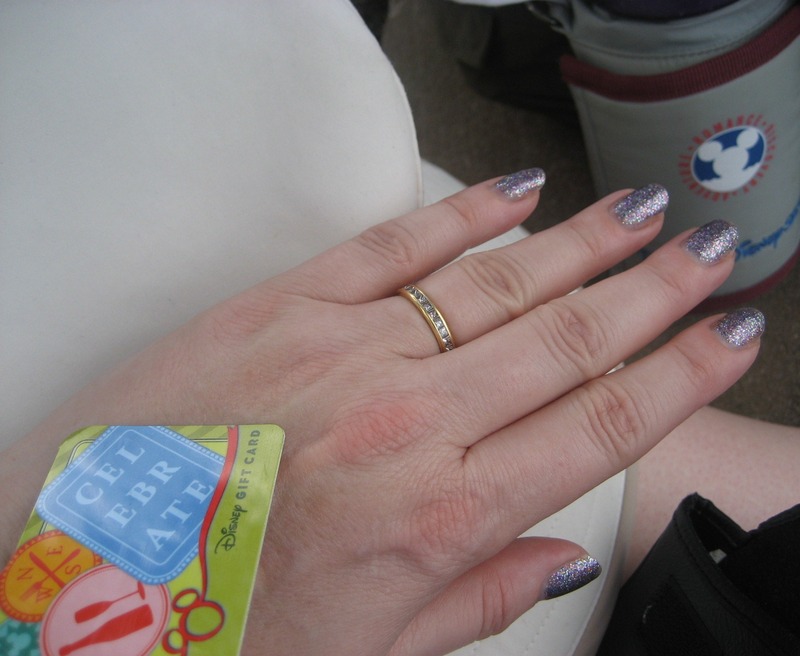 Oh, and so Universal wouldn't feel slighted, I wore OPI Funky Dunkey on my toes. It survived through water rides that got us completely soaked and so much more walking than I usually do. 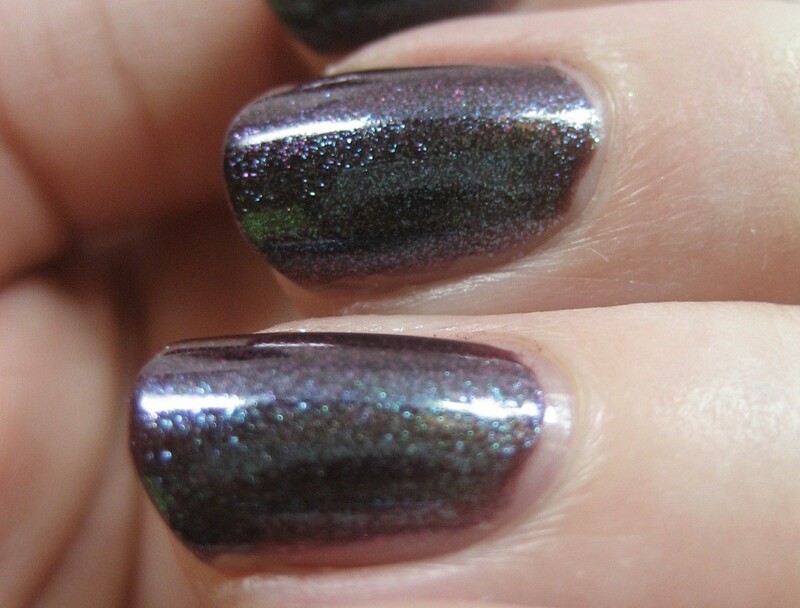 I've got a lot of catching up at work to do so might not be posting quite as frequently as usual this week, though I do have the two NOTD before Mad as a Hatter to post and some comparisons I did before we left so even if I don't get time to swatch this week I can still write entries. I'm a fan of Orly (which I say, "oar-lee", because when I first started buying their stuff LOLspeak wasn't around and "oh really" never occurred to me), so I consider it quite restrained behavior that I have not yet bought the whole Cosmic FX collection since not only does it come from one of my favorite brands but it's chock full of multichrome shimmery goodness, which appeals to the color lover in me. 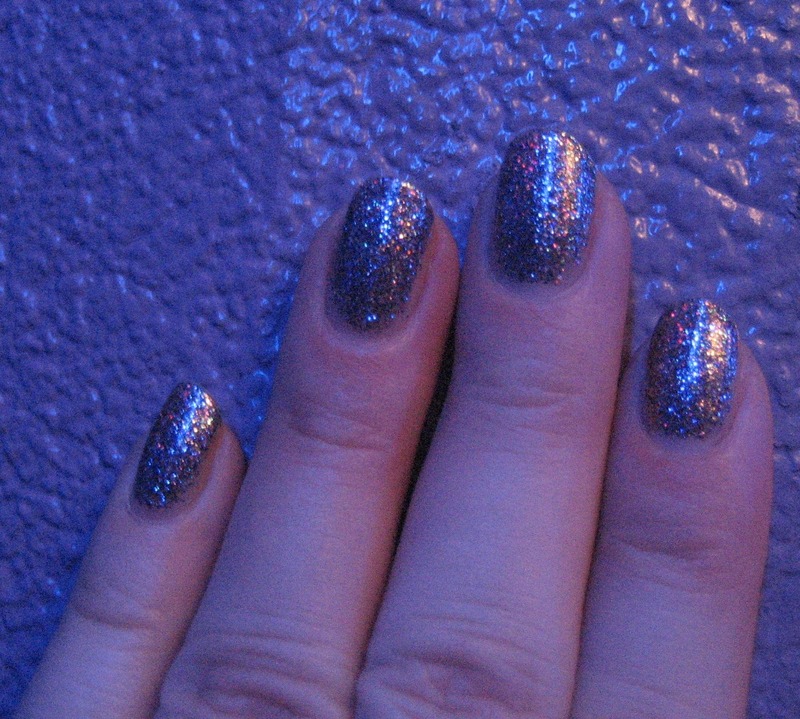 Today I have Galaxy Girl, which I wore for almost a week I liked it so much (that means I might catch up with my NOTD bit sooner). This one gave me fits trying to capture its complex nature with the camera, so I am going to share a whole bunch of pictures and hope you can get some idea of what was going on. This first set is indoors, in indirect light. I really like this one. I've read it described as a "bruise" color, but this is much prettier than any bruise I've ever gotten. 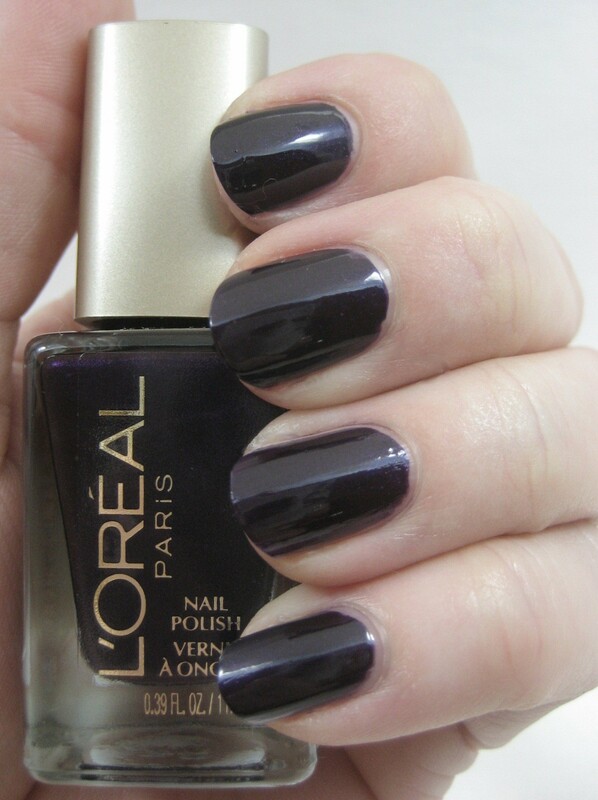 Remember the L'Oreal display with only one of each color polish in it? (Picture in this entry.) When I saw it the second time, there was BOGO50% sale on, so I got the two shimmers. 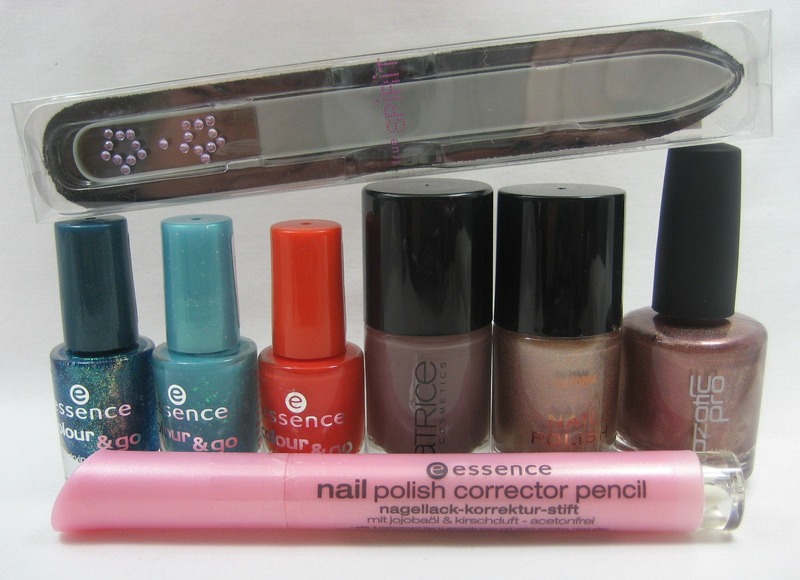 I tried the purple one, Luminescence, first (no big surprise there). The formula was fine; I used two coats. The two photos above are indoors, in the the indirect light of my lightbox. 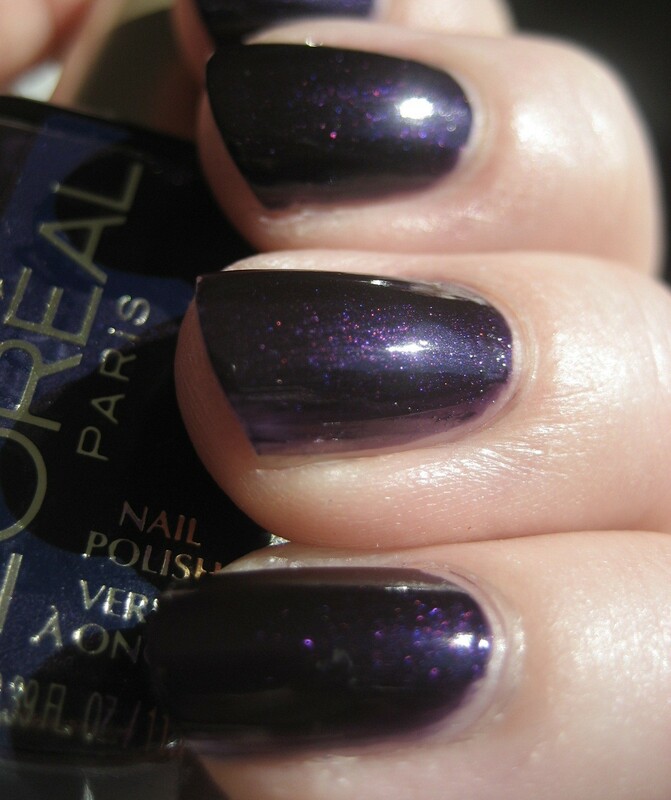 I was rather unexcited by the effect, a very dark plum with the shimmer pretty much disappearing into it. When I went outside into the sun (picture below), I could see the pink and purple and bright plum of the shimmer, and that was pretty. Being a purple lover, I was sure I'd find at least one dupe of this in my collection. Based on the shimmer and color in the bottle, I picked a couple from my purple drawer to compare. 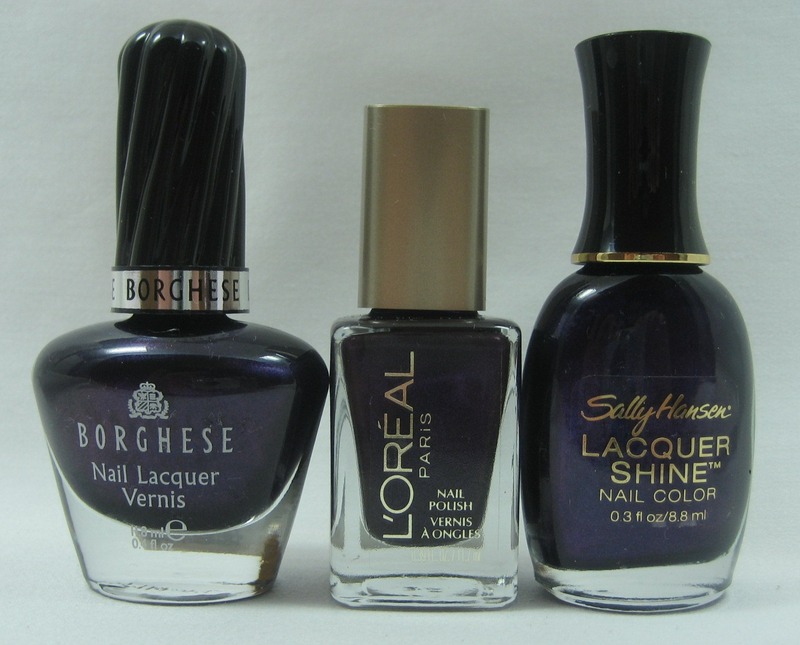 Left to right: Borghese Plummaggio Purple, L'Oreal Luminescence, Sally Hansen Lacquer Shine Spark. 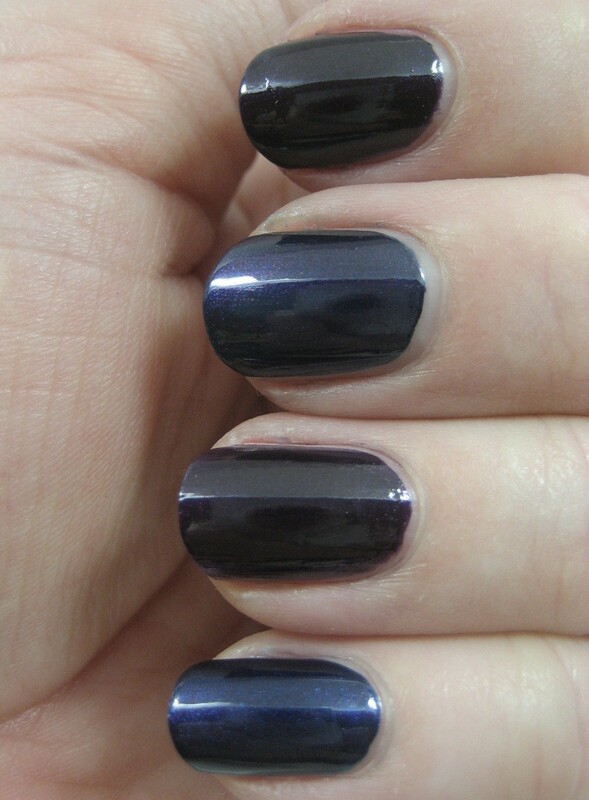 When I put the Borghese and Sally Hansen on my nails (both were two coats, like the L'Oreal), I saw they were more blue-toned and obviously shimmery. Top to bottom: Luminescence, Plummaggio Purple, Luminescence, Spark. 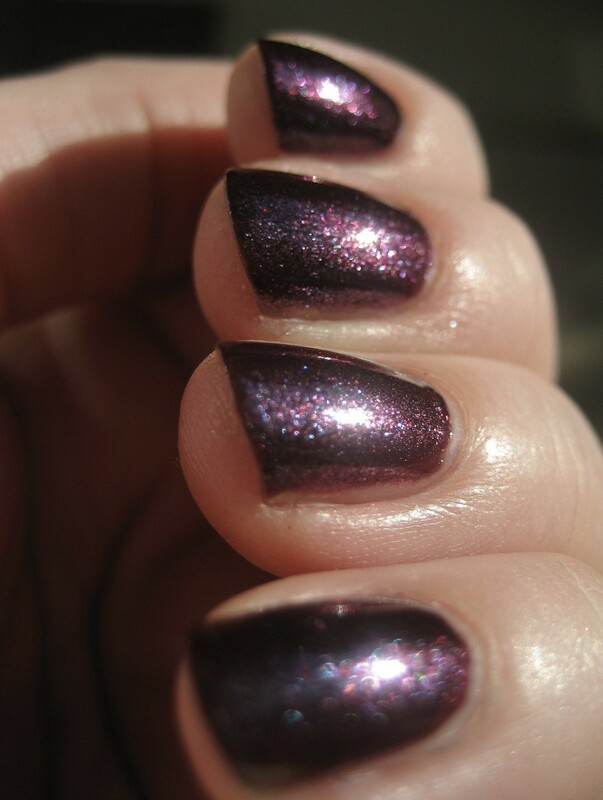 In the sun, even the shimmer on Plummaggio Purple and Spark showed more blue than the Luminsecence. Left to right: Luminescence, Plummaggio Purple, Luminescence, Spark. I'm still convinced I have something close to Luminescence; I just need to find it. Maybe that's why L'Oreal only put one of each in the display; they knew the colors weren't that special. Of the this group, my favorite is Spark. 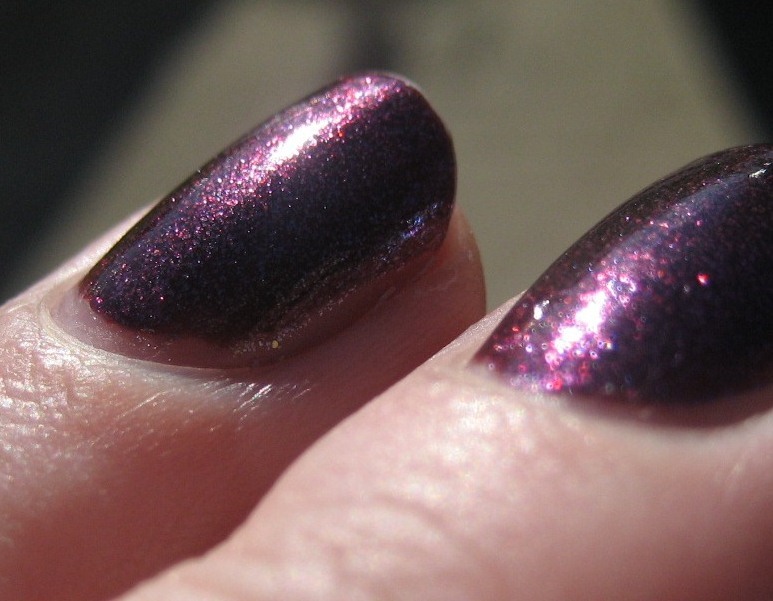 Unfortunately, that's been discontinued along with the rest of the Lacquer Shine line. Diamond Strength is still going strong but my beloved Lacquer Shine, not so much. and now that I have, I've fallen hard. 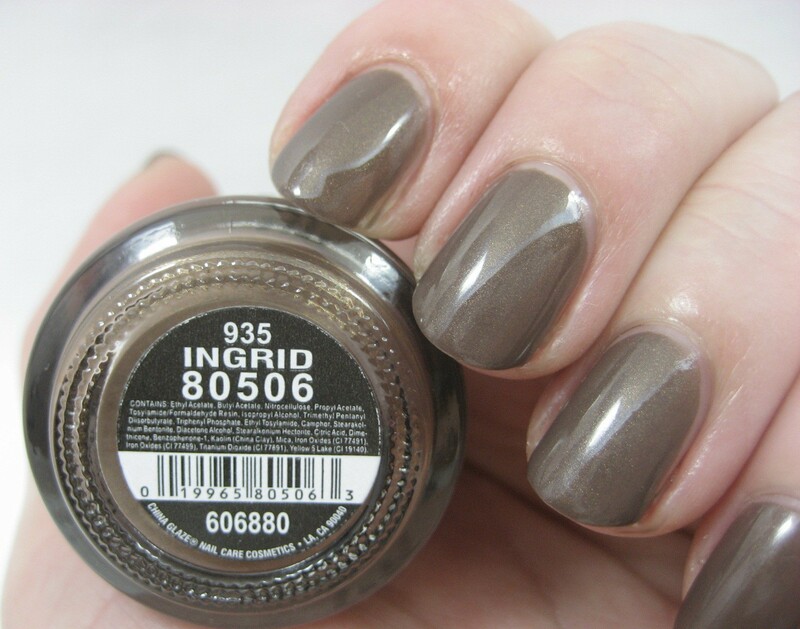 Ingrid is gorgeous. 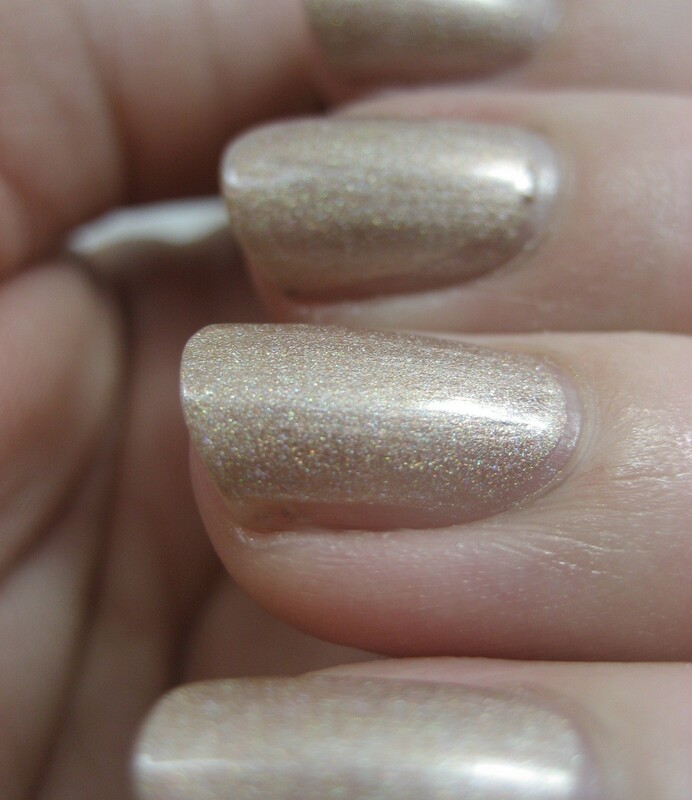 The micro glitter (I'd call it shimmer myself) looks more gold to me than copper, and I wouldn't think gold would look good with taupe either, but somehow in Ingrid it does. The shimmer is balanced just right; doesn't come forward too much and distract from the elegance of the base color but doesn't get lost in normal room light, either. If I hadn't given up buying backup bottles, I'd get one of Ingrid. I'm going to be taking some time off from the internet for the next week or so to have some fun offline. I've set up a few scheduled posts so this space won't be entirely dead, but I won't be reading comments and e-mail very often if at all during that time. I will catch up as soon as I can once I'm back at the keyboard. I have more swap goodies to share today, this time from my recent swap with Miranda of Mirannie's Nails. Polishes left to right: Essence Choose Me, Glisten Up, and Get the Fever; Catrice From Dusk to Dawn, H & M Cha Cha, and Ozotic Pro 524. 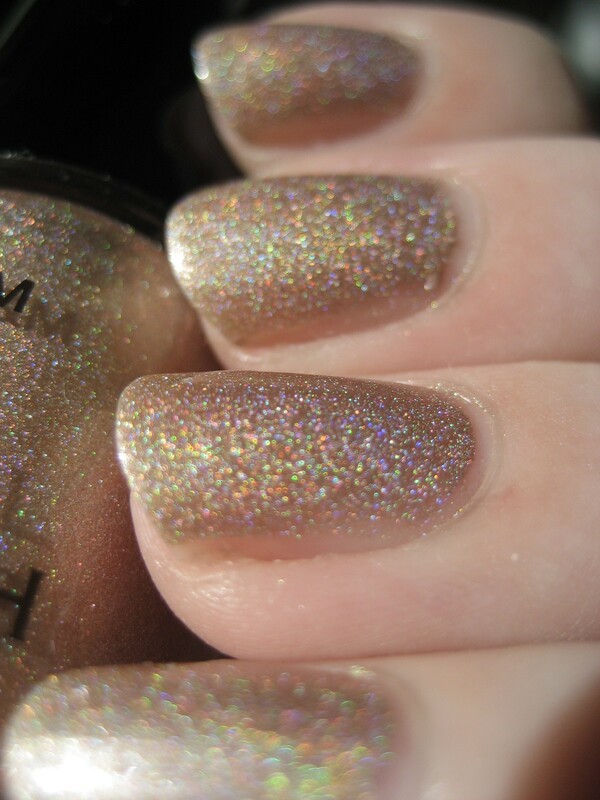 H & M Cha Cha was the first one I tried because there was sunshine when I started swatching, and there's no better polish for sunny weather than a holo. 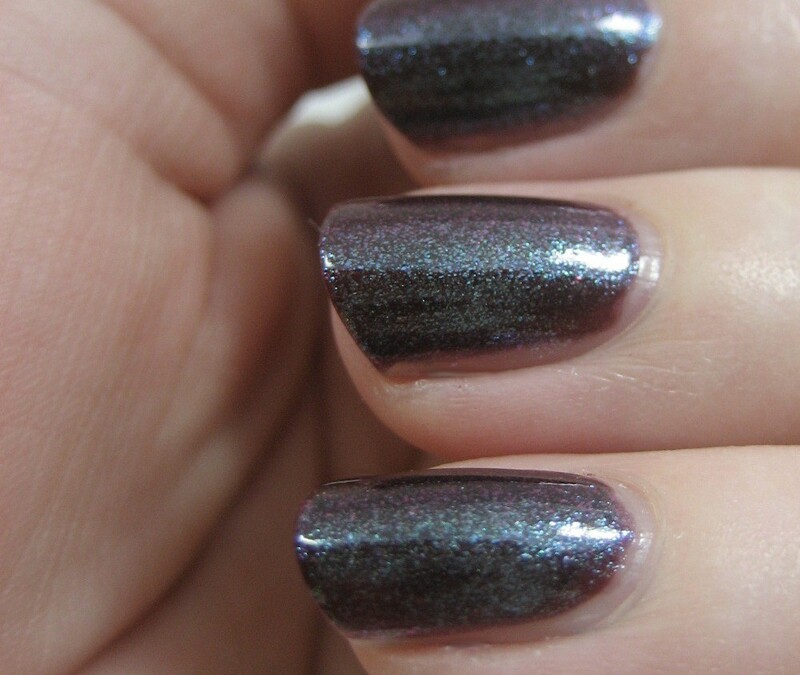 Application was fine; two coats over a base coat was good, and I skipped top coat because this was a swatching session. 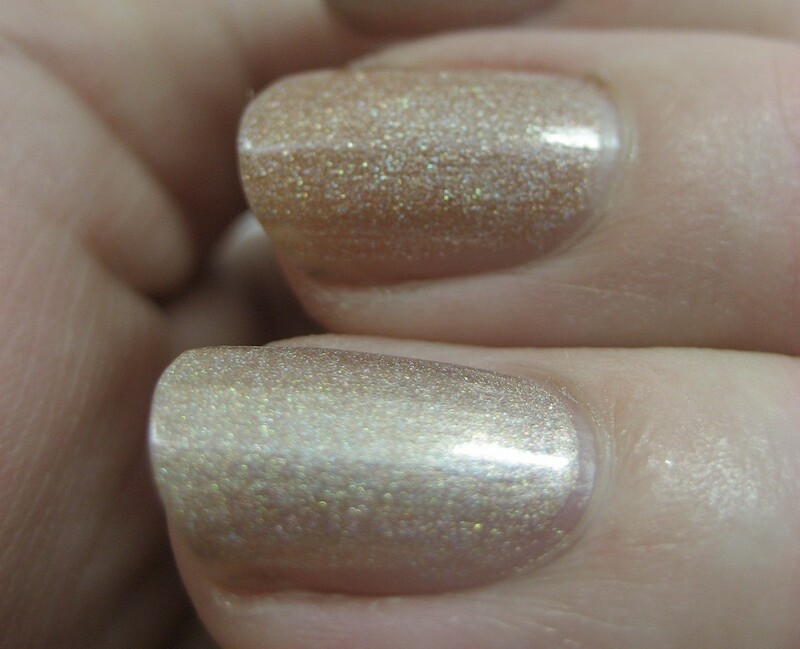 Indoors, in indirect light, Cha Cha is a slightly sparkly champagne color. Outside in the sunshine the colors come out to play. 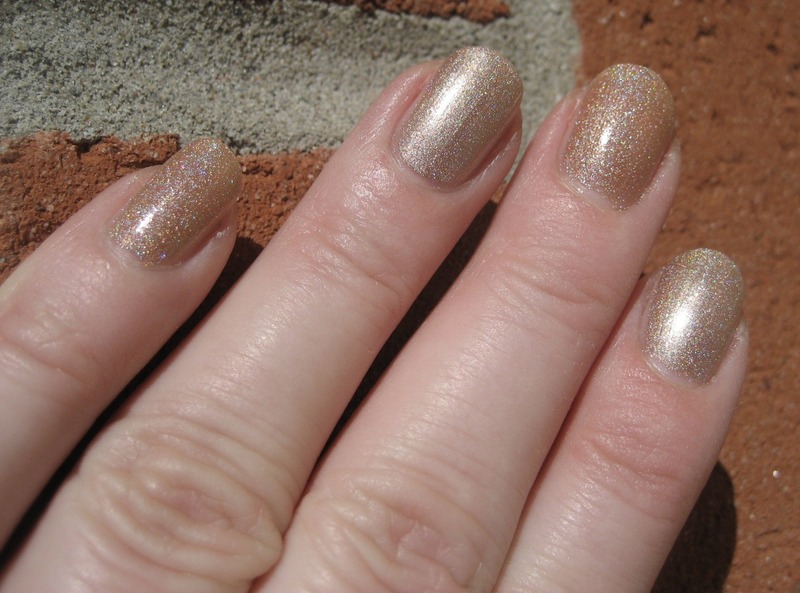 I decided to compare Cha Cha to another holo in my stash, OPI DS Classic, the polish I call my "office holo" because it's not too flashy for a customer meeting but very entertaining sitting in the sun at stoplights on my commute. 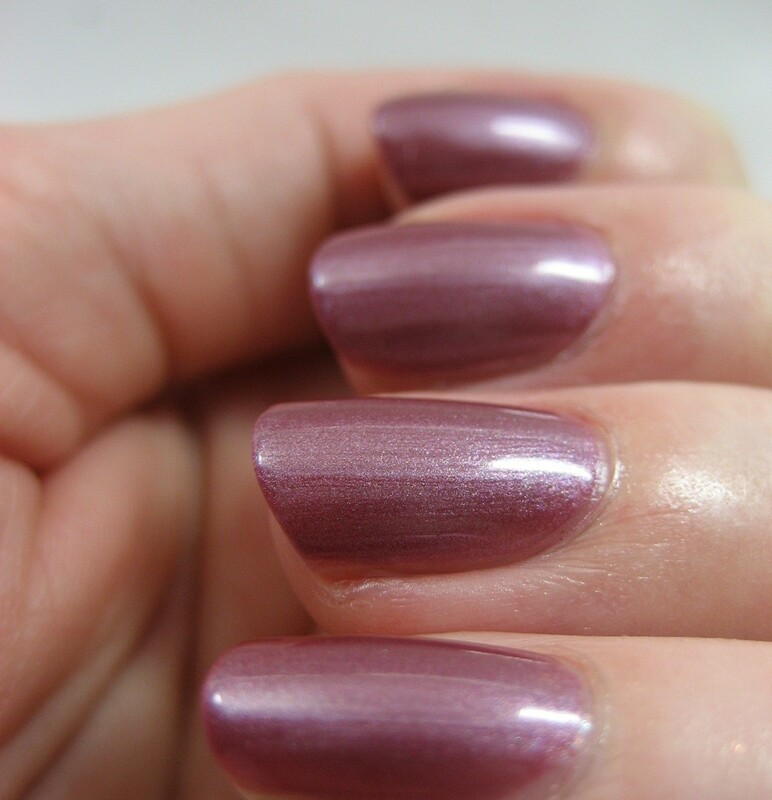 Two coats of DS Classic was a bit less opaque than two coats of Cha Cha. DS Classic is a little warmer-toned and a little deeper-hued. Top to bottom: H & M Cha Cha, OPI DS Classic, H & M Cha Cha, OPI DS Classic. 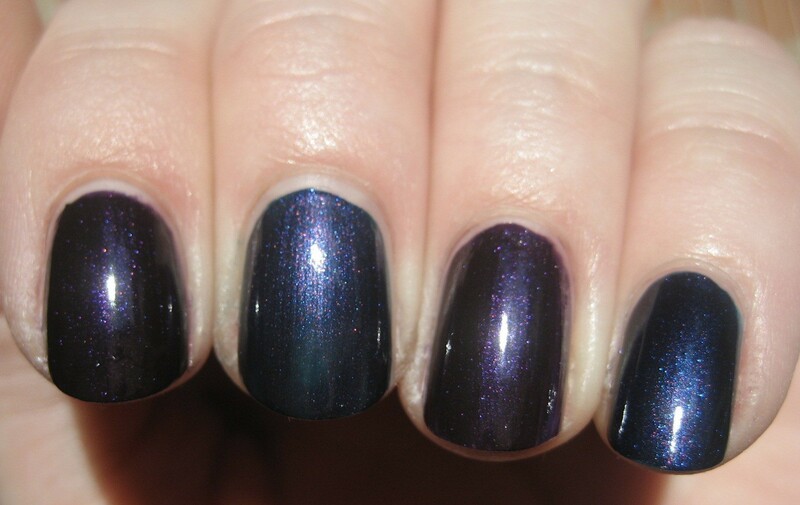 Top to bottom: OPI DS Classic, H & M Cha Cha. 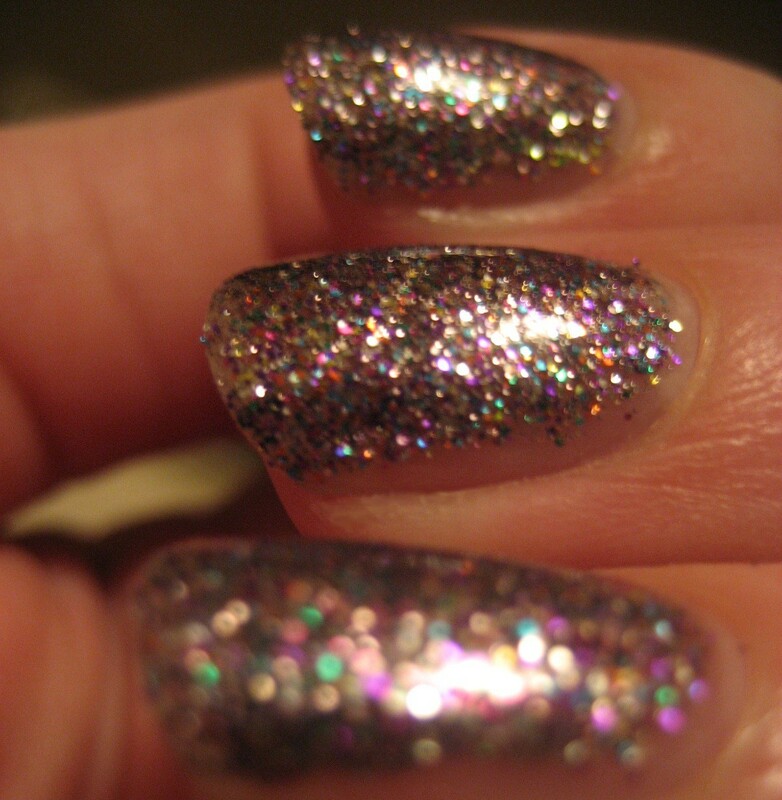 Outside, it was clear that the H & M is a finer grained and slightly less flamboyant holo, though they're both pretty. Left to right: OPI DS Classic, H & M Cha Cha, OPI DS Classic, H & M Cha Cha. Left to right: H & M Cha Cha, OPI DS Classic, H & M Cha Cha, OPI DS Classic. 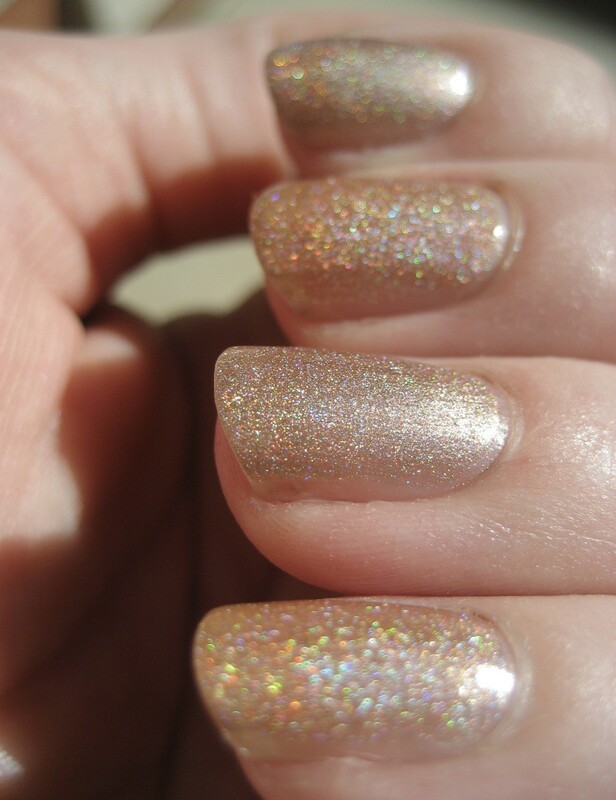 I think Cha Cha might be my new office holo. Thanks, Miranda! I'm happy to see that the random numbers resulted in a mix of winners: some people who've been following and/or commenting here since early on and some I've "met" much more recently, some people with blogs and some without, some names I recognize and some I don't, some in the U.S. and some not. Thanks to everyone who entered! I've been changing my polish more often than usual recently, so I've got more of a backlog of nails of the day pictures than usual, so there might be one of these posts every other day or so until I catch up. 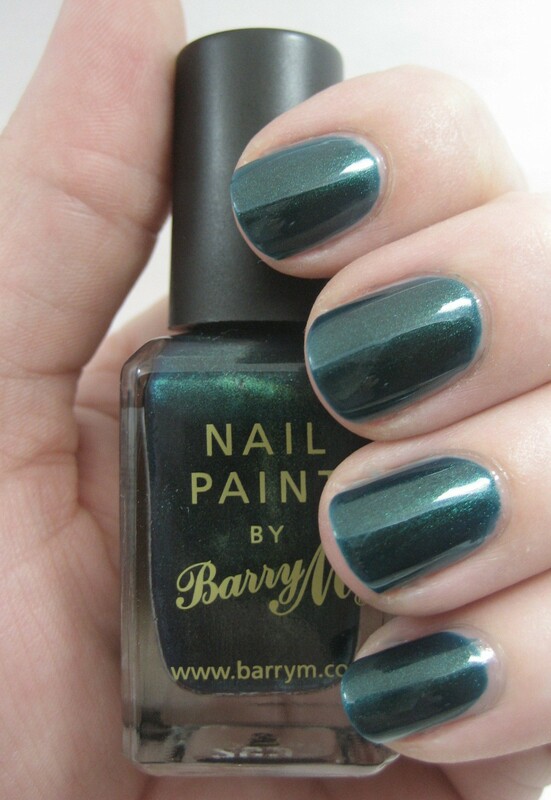 I put on Barry M Racing Green in honor of Michigan State University, the fine institution from which I got my degree, the colors for which are green and white. It's college football season now, so I want to support my team. 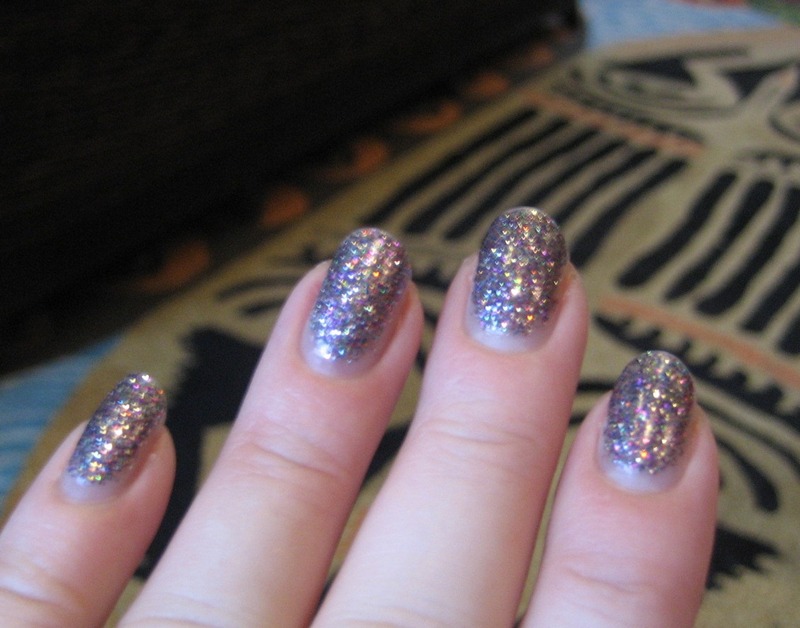 I used two coats of the Barry M plus topcoat and had no chips in the three days I wore this. 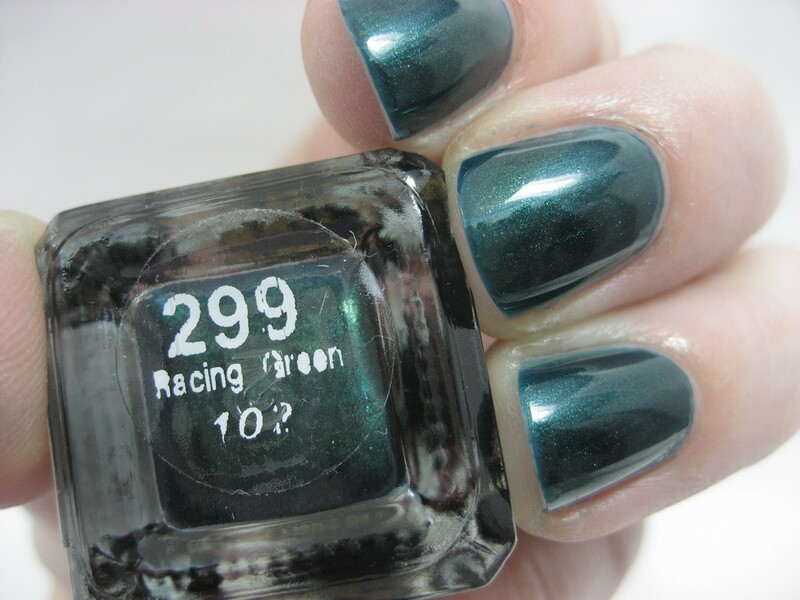 I've read that this is a dupe for China Glaze Emerald Fitzgerald, which is probably true, since I have Emerald Fitzgerald already. But this is special; it came all the way from England to me in a swap. And it has green right in the name, which seems to make it more appropriate for wearing when cheering the Green & White of Michigan State. I am delighted to be able to say the MSU beat our archrival, the University of Michigan, this past Saturday, on their home turf. That makes it three years in a row for the first time since the 1960s. Anything else the team manages to do this season is just gravy.